Jalousie windows are an interesting style of window that is characterized by horizontal slatted window panes that rotate to provide amazing ventilation. They are nearly identical to louvered windows and are often found in warm climates where using afternoon breezes to cool off a room is a must. Jalousie windows have a number of horizontal long thin slats of glass that can rotate by cranking or turning a handle, lever or crank. The turning motion causes all of the slats to rotate to create air channels into a room. The more the lever is turned (up to 90 degrees), the more breeze can enter through the opening. In this way they are somewhat similar to awnings. Because the slats are angled downward, rain will still run off the slats instead of entering. Jalousie windows can appear funky or clunky, but they have lots of charm that can be integrated into a home to great effect. They are used on porches or breezeways instead of the home itself because they allow in the breeze so easily. 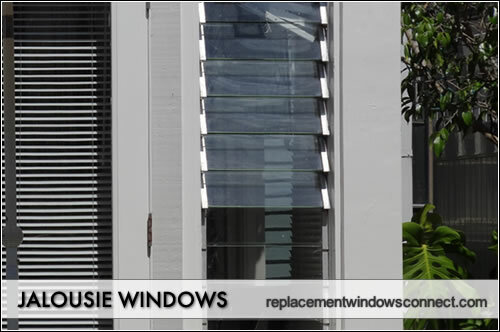 Compare to most other styles, jalousie windows allow for more ventilation and air to enter through the opening. Only rotating, awnings and casement windows are better at letter air in (casements may also let in rain in so that is one downside to these). Jalousie windows are perfect for hot places where the breeze needs to enter, but the sunlight needs to be filtered. This is why many use a darker tint on the outside to keep all that bright sunlight to a minimum. For homeowners who like the look of jalousie windows, these are a fantastic additions to a home. They simply can’t be mistaken for any other style (except for louvered, of course, which are the same thing with a different name). When they are properly integrated into a home’s design they can really add some nice visual interest. These windows wouldn’t hold up to an intruder, although if someone wants to get through a window it’s going to happen. However, an intruder could remove the slats of glass one by one (especially easy if the window is cranked open) and enter without making muchnoise. Jalousie windows are relatively inexpensive and are not necessarily built for durability. Plus, they have many movable parts that can begin to function less than perfect with time. They are also often used in tropical climates so all that humidity can take a toll on the hardware. Replacing slats of glass is cheap though.